Ig nobel peace award to car crushing mayor! Arturas Zuokas, the mayor of Vilnius, Lithuania has been awarded an Ig Nobel peace prize for demonstrating how the problem of illegally parked luxury cars can be solved by destroying them with a military tank. For those who missed it, here is the stunt that led to the award. Is this just a bit of fun? Personally I think it is another signal that people all around the worlds are getting impatient with the private car. Attitudes are changing. I am reminded that Ken Livingston was given an award for ‘policy innovation’ by Scientific American in 2003 after he introduced the congestion charge to London. Anyone who thinks the private car is secure in out cities should take notice of what William Clay Ford, great-grandson of Henry Ford and the current executive chairman of the Ford Motor Company is thinking. In 2000 at a Greenpeace business conference in London he said that “The day will come when the notion of car ownership becomes antiquated. If you live in a city, you don’t need to own a car” and went on to explain how Ford would reposition itself as a ‘purveyor of mobility’ and would own the vehicles and make them available to people when they need access to them. Ford, good to their word recently went into partnership with Zipcar offering cars on American university campuses for hire by the hour. Where do people die on urban roads? Caroline Russell from Islington Living Streets left a comment on my last post highlighting the fact that people get killed and seriously injured on artery roads, not on the residential roads where 20 mph speed limits are to be promoted by the government. Personally I think 20 mph limit area for residential roads are great and reduce the level of intimidation or pedestrians, I live in one. I am however also aware that people do indeed get killed and seriously injured on the arterial roads. Here is a map showing all killed and seriously injured in the period 2000-2008 inclusive for part of Islington/Hackney showing that injuries and deaths do indeed occur on arterial roads. Here is a map for a larger area – notice how the arterial road network is visible even at this scale solely from the location of traffic casualties. click to open the image at full resolution. And here is one for most of north London. Again the arterial road network can be identified very easily. Click to open the image at full resolution. Mapping using Stats19 police data for casualties, OpenStreetMap for the rail and rail networks and OS Boundary-Line for boundaries. Maps created using ITO Map (pre-release version). All maps cc-by-sa 3.0. My main interest here is on the needs of the pedestrian and Philip Hammond also promised a big expansion of 20 mph speed limit zones in urban areas where nearly all of the 403 pedestrian road fatalities, 5,000 serious injuries and 20,000 slight pedestrian injuries occurred during 2010; 42% of all road fatalities also occurred in urban areas. We need to continually remind people of the scale of the road safety problem in our country and press for these 20 mph limits in residential areas which have proved to be very effective. Here are a couple of maps showing the scale of our road safety problem. 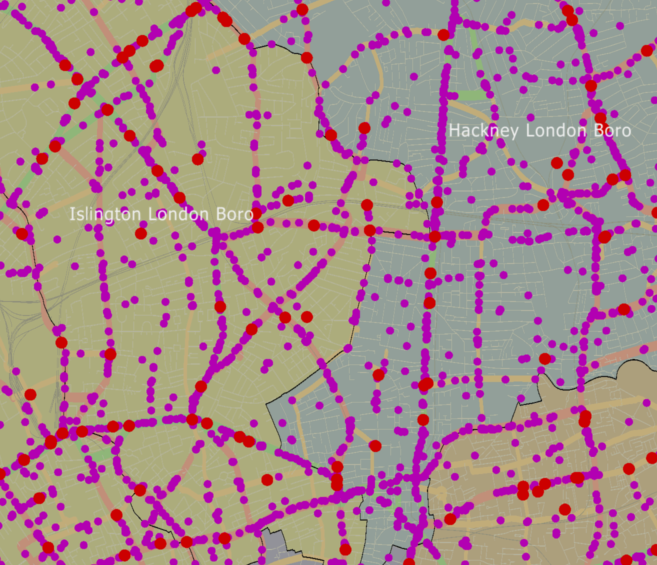 The first map shows the locations of all pedestrian deaths (red dots), serious injuries (purple dots) and slight injuries (blue dots) on GB roads between 2000 and 2008; other road deaths and serious injuries are shown using lighter grey dots. The boundaries are parliamentary constituencies. Click on the map to enlarge. 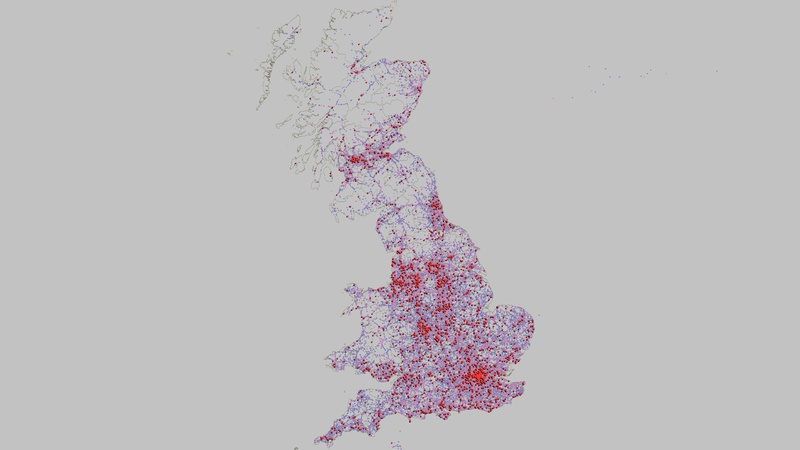 This second map shows all road fatalities (red), serious injuries (purple) and slight injuries (blue) for 2008 when 2,500 people died and 26,000 were seriously injured. Since 2005 the United Nations has supported the inspiring World Remembrance Day for Road Traffic Victims which is an opportunity to reflect and remember those killed on our roads. It takes place this year on 20th November with services across the UK and all round the world. Why not ensure that a suitable remembrance service is held near where you live this year? 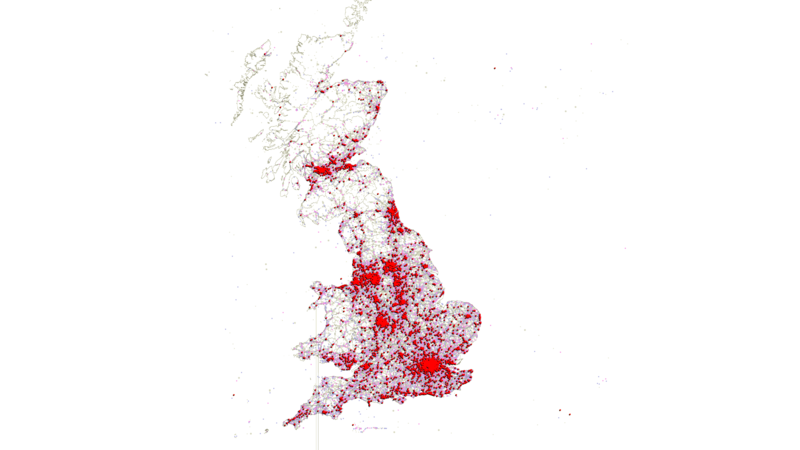 Mapping uses Stats19 police data and Ordnance Survey Boundary-Line data. Mapping created using ITO Map (pre-release version). Both maps available cc-by-sa 3.0. In Richmond, London the council has been forced to repay £1 million in parking fines to 18,500 motorists who were caught parking on the pavement by an incorrectly licenced CCTV enforcement vehicle. On the Isle of Man residents have persuaded the council to remove four steel posts that they had previously installed to protect the pavement from parked vehicles. They had been installed when a resident complained about the larger vehicles constantly blocking pavements on the corner. In Barnet there is another petition from local motorists demanding that the council stops giving them tickets for parking on the pavements. A disabled man in north London is up-in-arms about not being allowed to park on the pavement saying that the council ‘was only doing it to make money’. Shame that he can’t see what would be the result if they didn’t fine motorists for parking on the pavement. On a lighter note. Some enterprising, but possibly foolish, individual in Manchester tried issuing their own very convincing parking tickets complete with information on how to pay the apparent £60 (35 if paid promptly) fine to the ficticious ‘Greater Manchester Highways Safety Monitoring Partnership’ via and PO box number. A 40-year-old man has been arrested on suspicion of fraud and bailed pending further inquiries. However possibly we are actually get away lightly in the UK. Here are a couple of stories from other places. In Moscow they have an idea that creating a floating car park for 100 vehicles on the Moscow River by Vorobyovy Gory nature reserve with be the answer. The car park would be free to use and ‘be paid for by the cafe also included in the proposal’ which seems a little unlikely. The situation in Moscow seems terrible with motorists driving along the pavement as well as parking on it. Inspiration from around on world from Park(ing) day 2011 which took place yesterday when people all over the world reclaim parking meters for social and convivial purposes. Here are a few photos and a great piece of artwork from the people who created the event a few years ago. Great to see a neat little park hitting London’s streets with help from ibuyeco and the Woodland Trust. 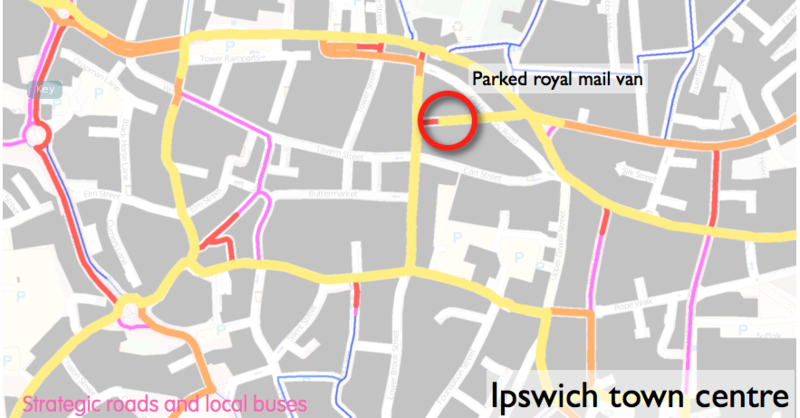 I spotted this royal mail van holding up two busy double-decker buses (with a capacity of over 100 people between them) parking on double yellow lines/no waiting area in Ipswich town centre yesterday. I pointed this out to the driver who took pleasure in getting out of the vehicle again, pointing at the royal crest on the driver’s door saying that this was royal business and they could ignore these irritating little rules; it appears that he is right, along with drivers of diplomatic vehicles they appear to be able to do what they like. I asked him to go and explain that to all the people in the buses but he declined. You will notice from the picture that there is plenty of space to park on the other side of the road avoiding any hold-up. 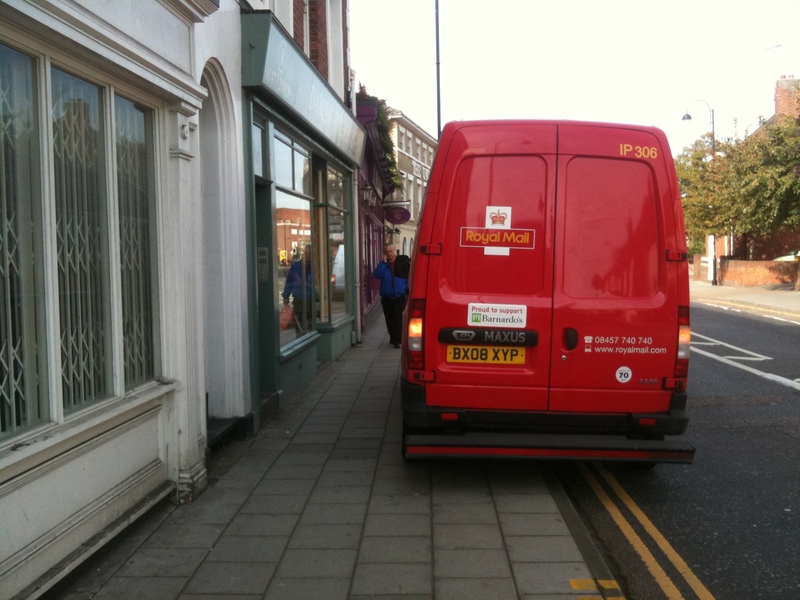 I subsequently spotted two more Royal Mail vans up on pavements in the town soon afterwards. This is not an isolated incident, these folk up in Darwen are also getting pretty upset about their local mail vans as well. A common theme about this whole parking malarkey is that too many people seen to think that just because it isn’t actually illegal then it must be OK to do it. Here is why it matters in this case. The map below shows where the the van was parked against a background map highlighting bus intensity (yellow is the highest, blue is lowest). Here is the location on Google Streetview. The second photo shows the van in question. Buses cost about £1 per minute to run btw ignoring for now the disruption to the many passengers who uses these popular routes. Map produced using soon-to-be-released features on ITO Map using bus data from Traveline, base mapping from OpenStreetMap & contributors, and building outlines from Ordnance Survey Settlement Line from VectorMapDistrict. 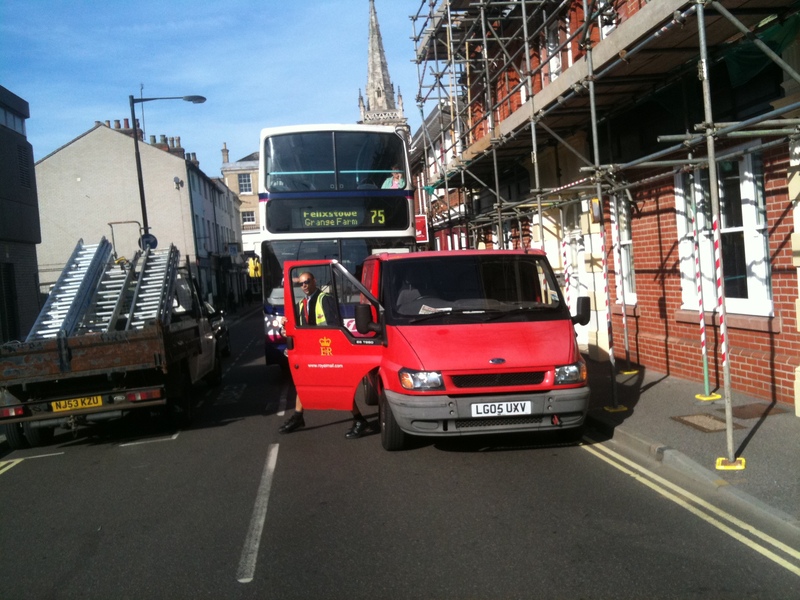 Here is the other van parked up on the pavement in town the same day. 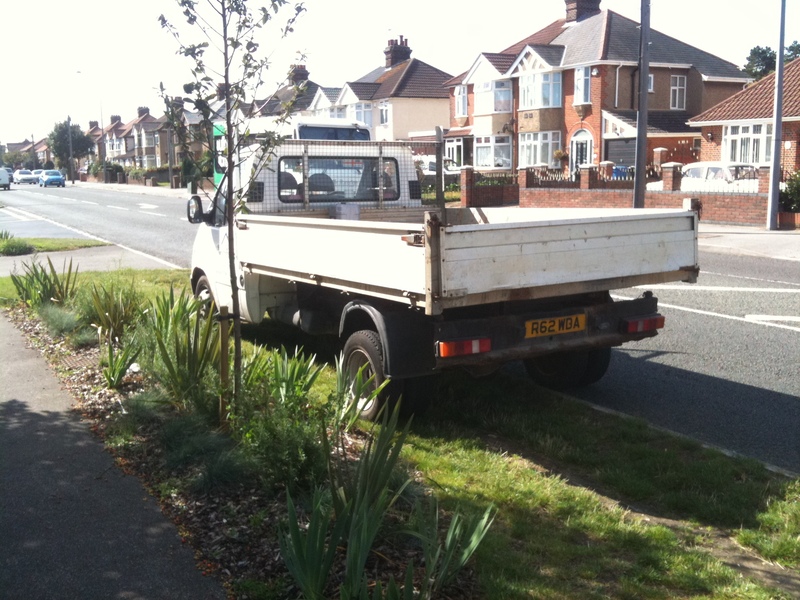 Today when I went past there was this builder’s van tucked onto the side of the verge. 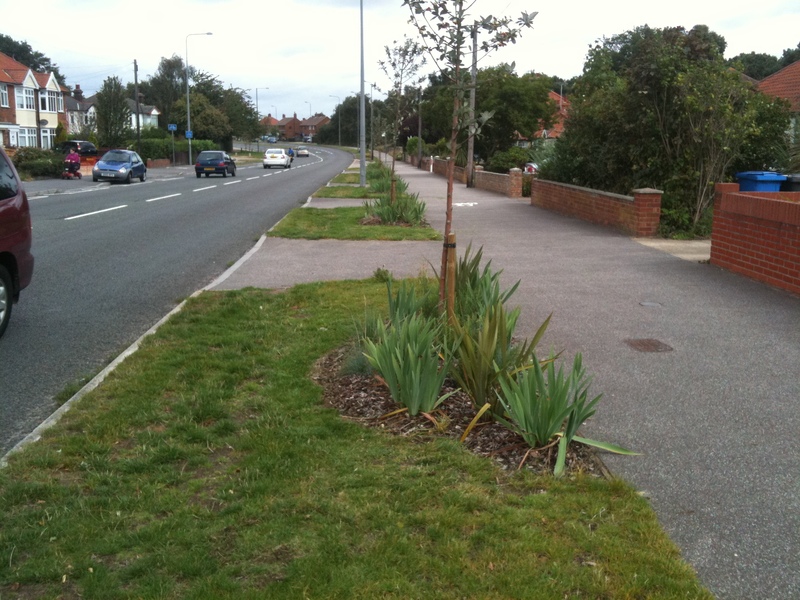 I will keep an eye on this verge and see if it ends up with cars all the way along and with the planting crushed. “Fighting like the flowers” is the title of the autobiography by the wonderful Lawrence D Hills’, a pioneer of the organical gardening movement in this country.